Rashmi Rajgopal of Saffronart looks at how Oomersi Mawji’s creations set a benchmark for silverware, and turns the spotlight on some of the pieces featuring in the upcoming Saffronart Autumn Auction of Fine Jewels and Silver. And now you want to know all about your new best silverware friends who saved you from the jaws of deception. You want to know everything: where they are from, what puts them in the minority of “true” legends and gives them that strange light glowing at the back of them as if they’re apostles. Telling exaggerations apart from truth requires proof, and you want to do your bit to ensure their survival. They’re Oomersi Mawji’s creations, after all. You start by asking for a little background on Mawji’s hometown of Cutch and what gave an edge to silverware originating from that region. Cutch was famed for its thriving cultural and political scene until the 19th century. Cursed first with a great earthquake and then with famine, many of its citizens were forced to migrate to the greener pastures of Karachi and Mumbai, both of which became centres for silver trade. You can imagine the massive culture drain that followed. Redemption lay entirely in the hands of the Mahraos of the region, and redeem it they did. Mahrao Bahadur set the ball rolling with his committed encouragement of the arts, especially silverware, in the region. Sure, the Mahraos deserved credit for bringing Cutch silver to the world’s attention, but aggressive marketing alone doesn’t sustain anything for too long. Here’s where our hero, Mr. Mawji, steps in. Oomersi Mawji fought his way up the rungs of reputation, first by switching family professions and then by stumping already established silversmith families with his stunning detailing of works and an acute display of craftsmanship. 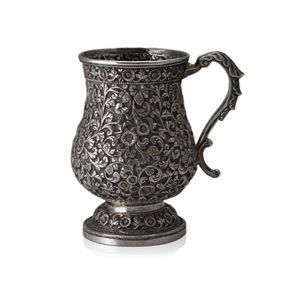 This feat was possible thanks to the very high standards of purity of silver (95-98%) used by Cutch artisans, whose sources were Mecca, Zanzibar, Bombay and the “Swahili Rand”, or from customers (Wynyard R.T. Wilkinson, Indian Silver 1858-1947, 1999: The Chameleon Press Ltd., 68). Sources of inspiration included a blend of Islamic and Hindu designs found on a stone-carving of a 15th century mosque in Ahmedabad (Ibid, 66) and 17th century Portuguese pottery from Coimba. 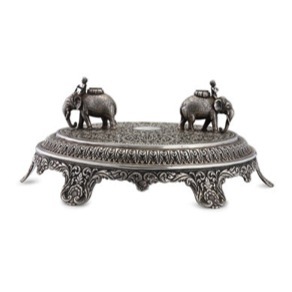 Several foreign expositions later, his works became immensely popular during the British Raj and he was deemed “best silversmith of nineteenth-century India” (Ibid, 69). His luck didn’t just end there: he was also appointed as court silversmith to the Maharaja of Cutch. Things bode well. The rest is history. Silverware was soon produced by Oomersi Mawji & Co. All this was short-lived; they closed up shop in the 1930s. Which makes their works all the more valuable and Mr. Mawji a true legend. Okay, he may have gotten lucky, you say, still in need of much convincing. So your eyes dart over the Oomersi Mawji pieces before you. You pick up the Rare Trophy Cup (Lot 104) and inspect it. At the centre of the acanthus repoussé motifs, you see a lion pouncing on a helpless deer. The expression of terror and doomed resignation on the deer, the single-minded ferocity of the lion, those leave you nodding your head in approval. Then you slide your finger over the pattern between the spaces. Fish scales, or armour rings. You’d have thought they would step back and admire their work for the lucid scrolling, the smooth contours and accuracy of expressions, but no—Mawji & Co. went right ahead and filled all that space with irreplicable intricacy. Of course, such detailing needs a mark, and you find that at the base of the trophy: O.M. Bhuj. You now feel slightly guilty for having expressed doubt at your saviours. But they’re okay with it, after eliciting a promise from you to view them at the Saffronart Online Auction taking place on the 23rd and 24th of this month. You also find their cousins Silver Tankard, Lot 105 and (yet another) Baluster Silver Mug, Lot 103 to be commanding the same degree of admiration. For the complete family of silverware, view the online catalogue. Better yet, drop by and see them for yourself.